Gold-infused formulas that revitalize and perfect. 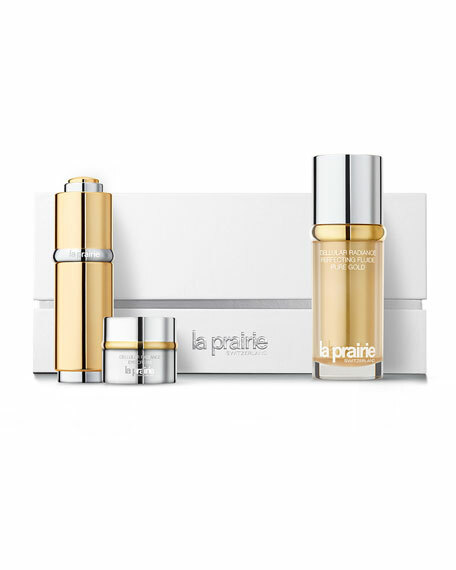 This limited-edition holiday set features three full-sized essentials from the Cellular Radiance Collection. Cellular Radiance Perfecting Fluide Pure Gold (1.35 oz./ 40 mL): This exquisite gold-infused moisturizer and perfecting treatment glides over the skin to deeply revitalize and improve texture. In an instant, skin is bathed in golden light, visibly perfected. Cellular Radiance Concentrate Pure Gold (1.0 oz./ 30 mL): This gold-infused serum encapsulates potent age-defying technology to revitalize and perfect skin. Fills fine lines and wrinkles temporarily to give the appearance of smoother skin. Instantly enhances the reflective properties of skin to give a subtle, flattering glow. Cellular Radiance Eye Cream (1.0 oz./ 15 mL): Rich indulgence for the eyes. Radiance Cellular Eye Cream revitalizes, hydrates and smoothes the delicate skin around your eyes, reducing the signs of stress and fatigue. For in-store inquiries, use sku #2426877.